Named European Winery of The Year in Wine Enthusiast's 2013 Wine Star Awards, Marques de Riscal is one of Rioja's legendary estates. In 1858 Herederos de Marqués de Riscal became the first winery in the Rioja to produce wines following the Bordeaux method of slow fermentation and careful blending. 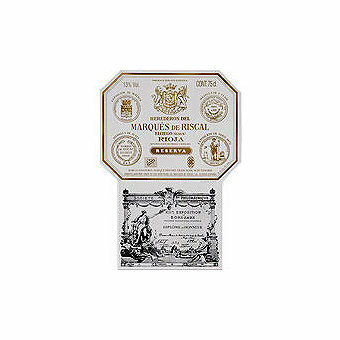 A classic Rioja wine, the Marqués de Riscal Reserva is 90% Tempranillo, 10% Graciano and Mazuelo from 30- to 40-year-old vines. A hand selection and triage is done as the grapes come in to the winery and only the best grapes of the vintage are selected for use in the Reserva. After slow, temperature controlled fermentation that brings deep color and extract, the wine spends approximately two years in American oak barrels, creating a fine structure and added complexity but extended bottle age as required for Reserva brings soft, supple tannins along with delightful fruit and spice that linger on a long finish. James Suckling scored this 93 points saying "This is a structured and power red with dried berry, chocolate, spice and salty, mineral character. Full-bodied, firm and chewy. Shows wonderful potential."